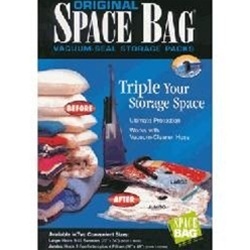 “Space Bags” are known for their ability to reduce clutter and save space. But Disaster Relief Supply has created a new use for this space-saving technology; to aid in emergency preparedness. Disaster Relief Supply, an online emergency preparedness supplier, is proud to add Space Bags to its already impressive inventory of specialized products. Space Bags are renowned for their ability to compress household items such as linens, clothing, outdoor gear, and much more to ¼ the size. But what does this product, commonly found at retailers like Wal-Mart, Bed Bath & Beyond, and Target have a use for at an emergency preparedness and disaster recovery store? “After brainstorming on resourceful, cost effective products, we came up with Space Bags,” says Mike Fisher, General Manager, “Most people think of them for space-saving, but they do more than just that.” Fisher explained that outside of clutter reduction, Space Bags can be a key component for building emergency kits and protecting valuables from damage. Emergency kits, bug-out-bags, and other preparedness kits are growing in popularity. Recently FEMA (Federal Emergency Management Agency) has promoted the importance of emergency kits in national advertisements, and a variety of kits have been featured on multiple cable network television shows like “Doomsday Preppers” and “Doomsday Bunkers”. A typical kit contains numerous survival products, but where do space-bags fit? Fisher says that “Space Bags aren’t necessarily an item to keep in your kit individually, but more so a space-saver for the kit itself. Most people want to include clothes, blankets, pillows, and outerwear, but don't have enough room.” According to manufacturer specs, a Space Bag can reduce total area by 75%, this allows more room for food, water, electronics, first aid, and more. Although Fisher admits that emergency kit usage was a great selling point by itself, him and his team at Disaster Relief Supply found another important use for these vacuum bags; flood-proof storage. Hurricanes and floods have the ability to cause inconsolable loss. Water flows inside a home destroying floors, furniture, appliances, and all else that is accessible. Given proper conditions an entire family’s possessions could be lost including important documents and valuable clothing and accessories. “Space Bags are completely weather and waterproof. They were never marketed for flood preparation, but it makes sense to use them,” claims Fisher. Space Bags are tested to be airtight and watertight, this means they can protect their contents even while submerged in water.